For the first time in a long time, the Toronto Blue Jays have legitimate organizational catching depth. In the past, talent was scarce behind the plate within the minor league system. Now, there’s a wealth of talent behind the dish for the Blue Jays. One of those promising young catching prospects is Riley Adams. The Blue Jays drafted the California native 99th overall during the 2017 MLB draft. Adams made his impact right away during his first full season with the Blue Jays Single-A affiliate Vancouver Canadians. He not only made the Northwest League All-Star team, he was also named the Canadians’ Most Valuable Player for the 2017 season. Adams admits he was a late bloomer in his career. He started playing baseball when he was a toddler, but he didn’t finally come into his own until his senior year of high school. Once the scouts started showing up to his games, that’s when Adams knew that baseball was a career path for him. 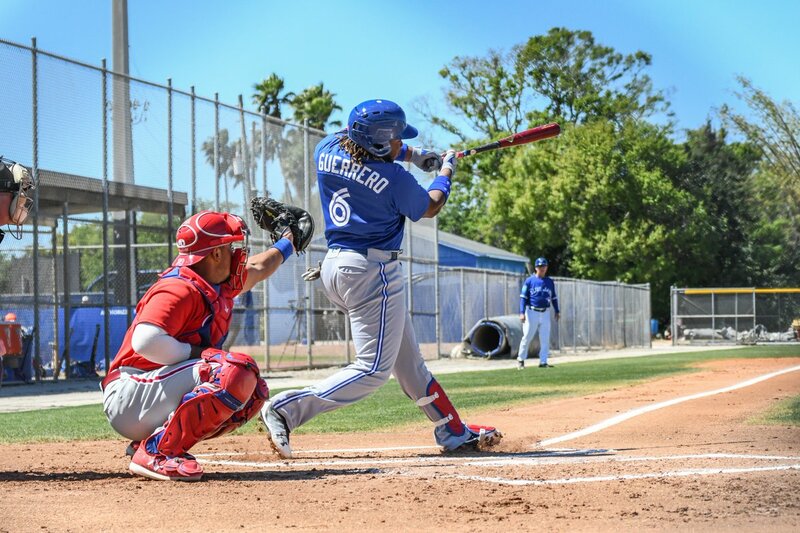 That determination is what helped the young catcher progress to the University of San Diego and ultimately motivated the Toronto Blue Jays to select him in the third round of the 2017 MLB entry draft. Draft day comes with a whirlwind of emotions for a youngster waiting by the phone or TV. For Adams, finding a home with a Major League team came with a sense of accomplishment, but it also came with a sense of relief. I think it was just relief than anything else to know this is the team that finally got me, this is the team that believes in me and wants to bring me into their organization. Your whole junior year of college you work towards getting drafted and putting yourself in the right spot to go play professional baseball. 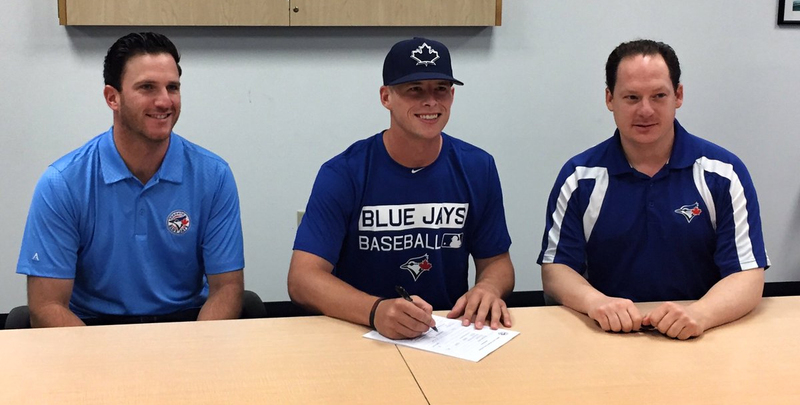 After the draft, Adams joined fellow Blue Jays draftee Logan Warmoth to play short-season Single-A ball in Vancouver with the Canadians. In 52 games with the Blue Jays affiliate, Riley posted a .305/.374/.438 slash line. His .305 average was the seventh highest in the Northwest League during the 2017 season. The catching prospect took away a few lessons from his first full season in the minors. Namely, if players are looking for advice or want to get better, the onus is on them to make the first move. The biggest difference from the college setting to the minor league setting is how much you’re kind of on your own. If you want to seek help, it’s up to the player to go out there and talk to a coach or a coordinator. They’re not necessarily coming directly to you like they would at the college level. If you want to be great and keep climbing the ranks and striving for the big leagues, then you can take all the appropriate measures to do that and all the coaches are going to be more than willing to help out. Catching is a very involved position on the diamond because they’re in constant communication with the pitching and coaching staff throughout the game. Riley says his most important job as a catcher is to take care of his battery mates. The catching side in general is something I try to take as much pride in it as I can. I feel obligated every single day that I’m working for this pitcher, I want to make this pitcher the best he can be. That’s easily the biggest part of it. The hitting part always comes secondary when you’re catching behind the dish. 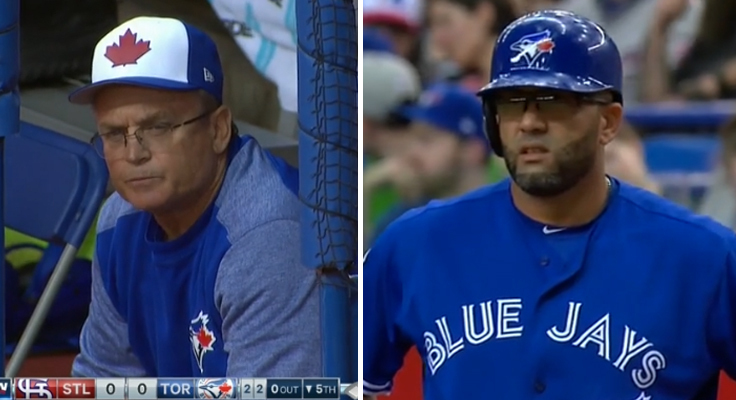 The Blue Jays’ catching depth has vastly improved over the past five years. The club boasts legitimate blue chip catching prospects at nearly every level of the minor leagues. Whether that’s Danny Jansen and Reese McGuire in Triple-A, or Max Pentecost or Adams in Single-A, there’s a wealth of catching talent coming through the ranks for the Blue Jays. With that many catchers in the pipeline, one would that might create a cutthroat environment between fellow backstops. Adams says it’s quite the opposite with the Blue Jays’ catching brethren. Our catching coordinator is really empowering us as catchers to work with each other and help each other out. They don’t see it as there’s only one guy who’s going to get to the big leagues from the catching side. Their goal is to see all of us in the big leagues. Whether we’re all playing for the Blue Jays or not, they just want us all to succeed. We’re all pulling on the same rope and that’s what makes our catching side of it special. After watching footage of his swing, the one thing that stands out immediately is how wide his stance is. Not only that, but how quiet and fluid his swing is. In an era of exaggerated leg kicks, Adams uses a very simple and unassuming swing to generate power. He says he’s drawn a comparison to another University of San Diego alumni: Kris Bryant. The Cubs’ third baseman also has a very wide stance and quiet approach and has used it with great success at the Major League level. Heading into 2018, Adams modified his stance slightly and even introduced a slight leg kick. This offseason, I made an adjustment to my stance to get into my legs a little more and utilize those more and have more of a leg kick to be able to get some more power. I know I’ve got some pretty strong legs, I just need to get into those a little more. I’m a taller guy, especially for a catcher, just to be able to use all these long levers I’ve got and generate some more power is what I’m trying to do. Nate Pearson is one of the Blue Jays’ most highly touted prospects entering 2018, but he was a relative unknown commodity last year. After making several top prospect lists and eliciting heavy praise from the Blue Jays’ front office, Pearson is on everybody’s radar. Adams had a front row seat as he caught Pearson on a regular basis as his teammate in the Northwest League. From catching him all summer, I’m shocked he went 29th overall. That’s amazing to me. I think we got a pretty awesome steal that he’s in our system. Pearson can throw triple-digit heat, which immediately captures people’s attention. As impressive as Pearson’s velocity is, Adams says the young phenom’s ability to locate his pitches is what makes him a potent weapon. I think something that people don’t look at him for is his accuracy; that’s what makes him such a special pitcher. He’s got really good control over all his pitches. He can throw as hard as he does, but he can spot up that fastball really well. He’s only 21-years-old, but Adams has a great deal of perspective for his age. It isn’t lost on him that he earns his livelihood doing something most people can only dream about. Baseball is still a kid’s game for him. The biggest thing I’ve always tried to remember is the fact that we’re playing a game for a living. It’s pretty special that we get to go out there and put on some baseball pants and just be on a baseball field and that’s how we make a living. Sometimes, you just kind of have to step back and say “Shoot, I’m one lucky person”. Follow Riley on his journey to the big leagues by checking him on Twitter: @RileyAdams.